Fifty young women considering their future careers have been introduced to the engineering world at London South Bank University (LSBU) for the second annual #Girls4STEM event. 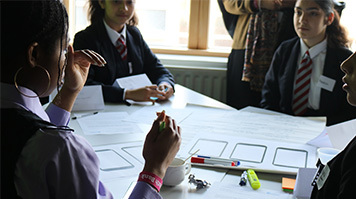 In conjunction with South Bank Engineering UTC, the event brought together girls aged 14 to 17 from the UTC, St Mary’s High in Croydon and Trinity Academy in Brixton to encourage them to give thought to a career in the Science, Technology, Engineering and Mathematics (STEM) industries. Students met a panel of female engineers and scientists and asked questions about working in the industry before solving an engineering problem in the ‘Hackathon’. LSBU School of Engineering Associate Professor Dr Safia Barikzai said the event was a chance to pique the interest of young girls and boost the number of women studying and working in the STEM industries, where there are skills shortages. “We held our first #Girls4STEM event last year and following its success, we decided to continue it this year,” Assoc Prof. Barikzai said. “The participants get the opportunity to meet their peers from other schools, work together to solve problems like engineers, and we hope being in the university environment for the day inspires them. Dan Cundy, Principal of South Bank Engineering UTC, commented on the disparity in the engineering sector, with the industry standard of just 9 per cent female representation. STEM employers, including King’s College Hospital, Skanska UK and St Thomas’ Hospital were represented at the event. Learn more about studying engineering at LSBU.